Speaking of bus bulbs, when are they going to fix the Nightmare on S 12th St right outside the Convention Center? There is SO MUCH sidewalk to work with here. I hate that I'm constantly zooming by buses trying pull back into traffic or getting cut off while they try to get to the curb . Looks like a federal slowdown of administering transit capital grants could slow down the Orange line, along with other national projects. This could also jeopardize the Blue and Green extensions that are assumed to get FTA funding. This should come as a surprise to absolutely no one. Yanking funding away from projects will put states like Minnesota in the position of having to abandon their projects or pony up the rest, a doubling of local costs that the GOP would use as an urban/rural wedge to victory. It's almost as if the current administration has no respect for the rule of law, historical precedence, or basic human decency. Halfway through the year, a ridership update from Metro Transit. Overall, ridership is down 2.6% compared with this time last year. That's due to a pretty alarming 4.6% drop in bus ridership. MSP had so far been doing decently compared with the national slump in bus ridership, but that may not be the case this year. The good news is that the system's newer investments are all outperforming expectations. Ridership is up 2.6% on the Green Line, which just continues its unbroken run of overperformance. Ridership is also up 1% on the Blue Line, 5% on the A Line, and 5% on Northstar (lol). The numbers in the report are midyear numbers, and since ridership seems to be highest in the fall, if the same increases were to remain constant, the year-end ridership numbers would increase from what is listed in the report (and since new development continues to open along transit, like the 200+ students moving into The Hub directly across from the East Bank Station, we might fairly expect a slight increase in the percentages). So projecting ahead, a 2.6% year-end increase for the Green Line would be 41,608 weekday riders, a 1% year-end increase for the Blue Line would be 31,825 weekday riders, and a 5% increase for the A Line would be 4,963 weekday riders. A 4.6% decline in bus ridership would be 176,422 weekday riders, a total loss of over 8,000. Anyway, the lesson I take from this is that a lot of new investment is needed to continue to grow transit ridership, especially in aBRT. The A Line has demonstrated that people will take the bus if the service is good enough. Metro Transit is making some nice moves to improve routes like the #2, but they need more support from the state and county government. Losses in bus ridership are a serious crisis for public transit nationwide, and I think we should be talking about it in much the same way we talk about an urban housing crisis. Hopefully the DFL gains ground at the statehouse this election season. If they do, aside from a gas tax increase, I'd like to see Hennepin and Ramsey Counties given the ability to increase their sales taxes another 0.25 - 0.5% for the purpose of fast-tracking aBRT expansion and decoupling it from the whims of the legislature. The big pressures on ridership are Uber, which is way more reliable than infrequent buses, low gas prices, and increased proliferation of teleworking. The only way to combat this is through high quality service, which is talked about far more than actually implemented. The insane amount of construction has meant that buses have spent much more time than usual crawling along at 5 MPH in traffic, and I think people are doing anything they can to avoid taking that ride. The trains, meanwhile, are largely unaffected, which makes riding them even more attractive. How about the bullsh*t rapid transit known as the Red Line? Any increase in ridership? Not that it would really matter unless it broke over 1,000. (and since new development continues to open along transit, like the 200+ students moving into The Hub directly across from the East Bank Station, we might fairly expect a slight increase in the percentages). I wonder if that shift does have a noticeable impact on bus ridership? I have to imagine there are thousands of less students riding the 3 regularly now that so many are a block or two from campus rather than at 24th & Como. Might be similar situations in other parts of town? I could definitely see construction being an issue. I’m think specifically of Route 2 with the Franklin Ave 35W bridge being redone. I know that during massive construction projects, the state/county/City encourages people to take transit instead of drive, but do they do any projections on how construction may affect transit ridership, either increase or decrease? If you want people to take transit to help with construction congestion, you have to give road priority to buses—otherwise it’s not better than a car. The proposed split erodes mobility and should not be implemented. There are many visually impaired residents in near NE and Marcy-Holmes, now we're going to permanently force them to transfer on the way to services in Whittier and The Wedge? 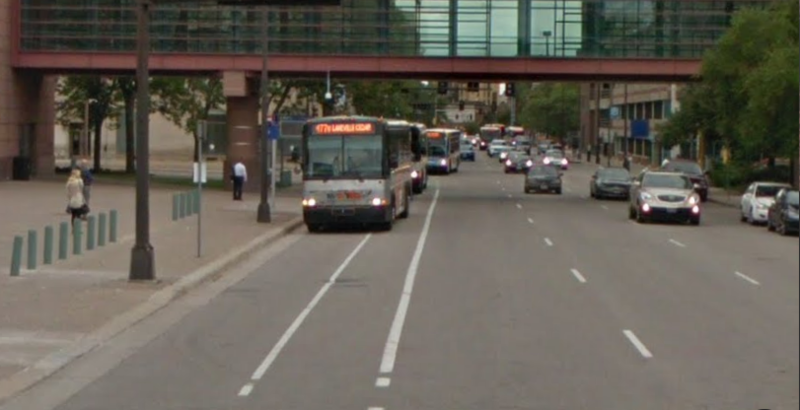 Why not talk more seriously about transit lanes on Hennepin in DT to improve reliability instead of treating the symptom and reducing the ability of our system to serve the people that rely on it the most. If a change just be implemented, the NE end should continue past MCTC to Lyn-Lake or the S Mpls end should continue over the river to 8th St SE. We don't tell car drivers that they need to park their car halfway to their destination and then get in a different car to finish. A transportation equity approach says we should prioritize how we treat transit riders, and the proposal to split the 4 isn't that. I agree ALL busses should be combined in to ONE single route that goes everywhere! Sure it may take you 72 hours to ride the entire bus but it would completely eliminate transfers for people who may not want to get up off the bus. And isn't that what is most important of all? Let's write a letter! That's an interesting question, I certainly don't have a good answer to it. My instinct would be that for specialized services, say a campus-only bus network, it could get pretty zero sum. But with a metro-wide system, if there are new people moving into the units that formerly housed students, then maybe they're riding the bus too. I lived for a year post-graduation in that Como area with four other housemates, and three of us took the bus to work (I biked, the fifth drove). It's an extremely affordable area and probably would have a high rate of transit use even if more non-students lived there. New 550-space park and ride at I-94 and Manning in Lake Elmo opening next year. We sure like to do the "build it and they will come" philosophy when it comes to suburban transit. So Lake Elmo didn't want the Gold Line routed through their community, but they're okay with a park & ride and express buses? Not that it matters at this point, but I would require the city council to remove the ban on routing BRT through their community and then they can have their park & ride. Doesn't mean the Gold Line would be routed through there, but if they want this park & ride then they need to be less hostile towards transit. Is there any bus service between the Twin Cities and Hudson, privately or publicly run? Would be nice if there was especially if it ran all day and served Downtown Hudson. There is no Metro Transit service to Hudson - that would require Wisconsin, or at least St. Croix County, to help fund it, and if you think the Minnesota state government is hostile to transit, Wisconsin is on a whole nother level. There doesn't appear to be private bus service to Hudson either - Greyhound and Jefferson Lines both have (or possibly code-share) routes from MSP to Eau Claire and points east that run right through on I-94, but Hudson doesn't appear to rate even a gas station exit stop.